Where can I store my luggage in New York? Need to store your luggage in the buzzing metropolis that is New York, also known as the Big 🍎? Perhaps you are visiting for their world-renowned shopping and need to store your new goodies?Unless you are lucky enough to live like a local and rent an apartment in NYC, you probably asked yourself "Where can I store my luggage near me?". Many of the museums and venues also do not allow bags inside. In the city that never sleeps, we can guarantee that you will want to explore as much as possible without your bags. Stasher is the world’s first luggage storage network of the sharing economy. Through a network of local businesses (StashPoints), we provide you with a convenient, affordable and secure way to store your bags all over New York for a few hours to a few days! How much does it cost to store your luggage in New York? It’s just $6 per day, and $5 for the second day! Where are the StashPoints for my luggage in New York? Stasher has a network of hundreds of hotels and shops across the world. Our innovative luggage storage solution provides an on-demand service for travellers – and a much cheaper alternative than station lockers. Whether you are discovering the most instagrammable places in NYC, exploring Central Park, around Grand Central Station, Times Square, SoHo, or marvelling at the Statue of Liberty 🗽 – your bag can be safely stored with us. Most of our luggage storage facilities are open 24/7, so that you don’t have to plan around picking up or dropping off your bag. There are no luggage storage options inside Central Park, however there are plenty of options around. Where can I find luggage storage near Central Park? These are the two most popular luggage storage facilities around Central Park. Booking online is required before you drop in your bags. Phones and Electronics Store, just a short walk to the west of the Park. Open until 19:00 on weekdays. Al Horno East Side, at Lenox Hill. Open until 21:30. Most locations are open until late in the evening or even 24/7. Opening times may vary, so make sure to check before booking. It’s $6 per day, and £5/$5 for any additional day. The park occupies an area of 840 acres (340 hectares) and extends between 59th and 110th streets (that’s about 4 km/2,5 miles) and between Fifth and Eighth avenues (about 0.8km/0.5 miles). The Metropolitan Museum of Art is only a short walk away, facing Fifth Avenue. Inside the park you can find three lakes, a zoo, an open-air theatre, playgrounds and an ice-skating rink, among many footpaths and bicycle routes. Times Square is one of the busiest places on the globe. There are many affordable luggage storage options around the square. You need to book online before you drop in your bags. Where can I find luggage storage near Times Square? Times Square Phone Shop, at the heart of Times Square. Open until 23:00 every day. Al Horno West Side, at Hell’s Kitchen, just a short walk away from Times Square. Around the World Fashion Publications, open until 19:30 every day. Most locations are open until late in the evening. It is recommended that you check before booking online, so you can find a place that fits your particular needs. It’s just £6/$6 per day, and £5/$5 for any additional day. 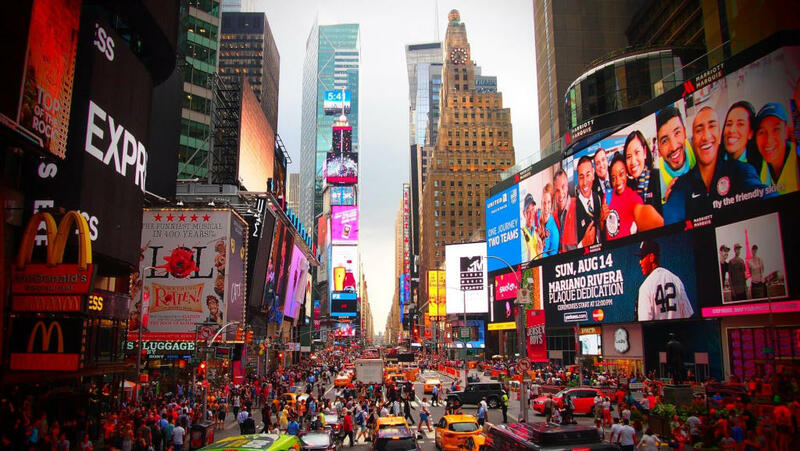 Times Square is an important commercial intersection, visited by millions of tourists every year. It is located between West 42nd and West 47th streets. Times Square is commonly referred to as “The Crossroads of the World”, as it is one of the planet’s busiest pedestrian areas. Until 1904, when the New York Times moved their headquarters there, it was known as the Longacre Square. Around one million visitors visit the Times Square during the annual New Year’s Eve ball drop. Where can I find luggage storage near SoHo? Canal Street Clothing Store, located in Tribeca. Open until 20:00. NYC Falafel, the tasty option, open 24/7. Lower East Side Convenience Store, on Delancey Street. Open 24/7. Most of the luggage storage options around SoHo are open until late or even 24/7. It is recommended that you check out the exact times before booking online. It’s $6 per day, and $5 for any additional day. SoHo (the name is an abbreviation of South of Houston Street) is a hip neighbourhood in Lower Manhattan. Known around the world for its cast-iron buildings and artistic vibes, this is definitely a destination worth exploring. SoHo is a shopper’s paradise, with many high-end boutiques and stores to be found on its streets. The neighbourhood is also known for its luxury nightlife options, as you can find many upscale bars and restaurants around the area. There are plenty of options to store your luggage around the Grand Central Terminal in New York. Booking online is required. Where can I find luggage storage near Grand Central Terminal? One Hour Framing Shop, a 3-minute walk from Grand Central Terminal. New York Koreatown Hair Salon, on Murray Hill, just a stone’s throw from the Terminal. Midtown East Dry Cleaners, behind the Grand Central Terminal. Open until 19:00. Although most facilities are open until late in the evening, it is recommended that you double check before you book your luggage storage online. It’s just $6 per day, and $5 for any additional day. The architecture and interior design of the station house have earned it a place in the US National Historic Landmark list. The terminal itself is visited by millions of tourists each year, excluding passengers. Grand Central Terminal has 44 platforms, more than any other station in the world. Its platforms serve more than 60 tracks. Pennsylvania Station (affectionately called Penn Station by the locals) is the main intercity railroad hub in New York City. Book your Penn Stationluggage storage online and explore one of the busiest areas in Manhattan! Where can I find luggage storage near Pennsylvania Station? Most luggage storage facilities around Penn Station are open until late to accommodate travellers. However, we recommend that you always double check with each store before booking. Pennsylvania Station is the busiest train station in the Western hemisphere, serving more than 600,000 passengers per average weekday. There is a United Airlines ticketing office inside the station. There are no lockers and left luggage facilities at New York’s main train station. There are a couple of traditional ones still around - including Schwartz Travel & Storage and City CoPilot, charging $10 for each bag. While their prices are not as high as other luggage facilities, their storage locations are limited, with two or three drop off points across the whole city. Make sure to check on their websites if they have a facility close to where you need it. If you’re planning on going to the Metropolitan Museum of Art during your stay in New York, remember that they only allow in bags of the size of a daypack. Luggage, carry-on bags, and oversize backpacks are not allowed in the Museum and cannot be checked in at the coat-check facilities. Located in the heart of midtown Manhattan, the Museum of Modern Art only accepts items up to 28 x 38 x 13 cm. Larger items up to 36 x 56 x 23 cm must be checked. Any luggage bigger than the above size won’t be accepted. The museum has two coat checks located inside the main entrance and in the lower level of the Rose Center. Coats, umbrellas and bags may be checked for $2 per person, space permitting. Visitors are highly discouraged from bringing large items such as backpacks as they won’t be allowed in. The Guggenheim Museum has a dedicated coat room for small backpacks, umbrellas and stroller. Bear in mind that luggage and large begs are not permitted in the museum and cannot be checked in. JFK Airport offers a limited luggage storage service – if you have a long layover and want to drop our bags off before heading to the city there are a couple of options available for you. It costs between $4 to $16 per day depending on the size of your luggage. It is not possible to store luggage at La Guardia Airport. If you’re arriving at this airport and need to store your bags we suggest checking one of the luggage storage facilities in New York City. It is possible to store your luggage at Newark Airport, but to do so you must check with your airline carrier.